Wedding cakes are a specialty of VGs. In fact, VGs has the most delicious and reasonably priced wedding cakes. Not only do we pride ourselves on making a wedding cake your guests will enjoy eating, our designs are beautiful and in keeping with the latest trends and traditional elegance. We work with you to design a cake that fits your wedding day and personal taste. While we do have many popular designs, we prefer to design a cake that personalizes your day. As you know, weddings are about planning in advance – please call to schedule an appointment and secure your date. Upon completion of your first appointment we will arrange for a tasting. Delivery and setup are available the day of the wedding – ask for details. Check out our photo album of wedding cakes. VG Donut & Bakery offers an exciting alternative to the traditional wedding cake option. 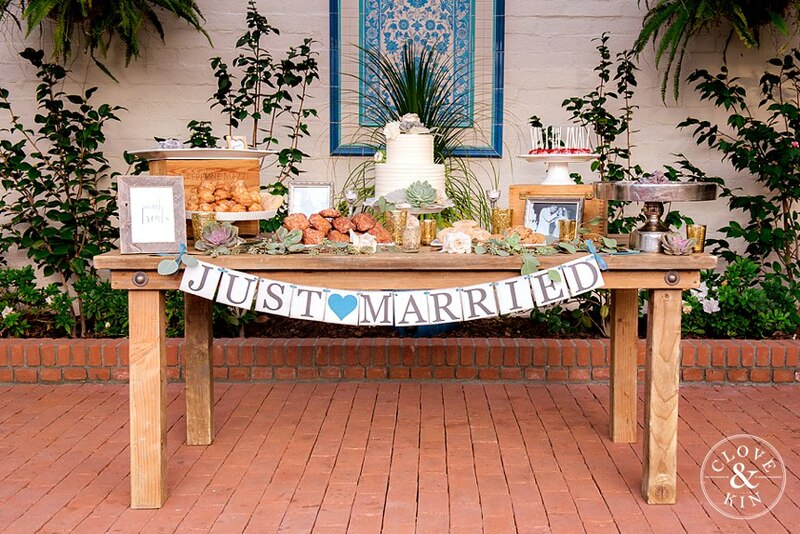 Couples have the opportunity to treat their guests to a beautiful dessert bar on their special day. Popular dessert bar treats include: donut bites, cupcakes, cookies, blondies, brownies, lemon bars and more. As you know, weddings are about planning in advance – please call to schedule an appointment and secure your date. Please see below for a list of items and talk with our wedding cake coordinator about your options. Upon completion of your first appointment we will arrange for a tasting. Check out our photo album of dessert bars. Q. What is the cancellation fee? A. Cancellation within 10 days of the wedding will be subject to a forfeiture of 100% of the cost. Q. Do you offer delivery? A. Delivery and setup are available – please call for details. Q. How far in advance should I order my wedding cake? A. We encourage our customers to start the process 6- 8 months prior to their date. Please reach out to us regardless of your date as we would love to create your wedding cake if we are available! A. Yes, a $100 deposit is required on all wedding cakes. Q. Is it possible to have a different flavor for each layer of your cake? A. Yes, you can order a different cake and filling combination for each layer. Q. Is it possible to add fresh flowers as decoration on my cake? A. Yes, your florist can add fresh flower decorations to your cake. Q. When is my final payment due? A. All details including final payment, size, flavors & fillings, design and directions for delivery need to be completed 14 days prior to your event date! SORRY NO EXCEPTIONS! White – Traditional, light and moist with a hint of orange vanilla. Available with vanilla or chocolate buttercream icing. Chocolate – Very moist, deep fudge cupcake. Available with vanilla or chocolate buttercream icing. Marble – Combination of white and chocolate. Available with vanilla or chocolate buttercream icing. Carrot – Very moist and full of fresh carrots topped with cream cheese icing. Toasted coconut topping optional. Red Velvet – Light chocolate flavor topped cream cheese icing. Red Velvet cake crumb topping is optional. Gluten Free Banana – Light and moist banana cupcake topped with cream cheese icing. Gluten Free Pumpkin (seasonal) – GF pumpkin cupcake filled with a pumpkin mousse, topped with cinnamon buttercream. Lemon Cream – White cupcake filled with our signature lemon cream filling, topped with vanilla buttercream icing. Cookies and Cream – Marble cupcake filled chocolate bavarian cream, topped with vanilla buttercream and Oreo cookie crumbs. Peanut Butter – Chocolate cupcake topped with chocolate buttercream and peanut butter cookie crumbs. Triple Fudge Brownie – A chocolate lovers dream. Pear Almond Cranberry Tart (seasonal – fall) – classic tart dough topped with almond cream, fresh pears, and cranberries. Sprinkled with a honey drizzle, toasted almonds, and cinnamon sugar. Fresh Fruit Tart (seasonal – spring/summer) – classic tart dough topped with our signature bavarian cream and fresh summer fruits (strawberries, blueberries, kiwis and mandarin oranges). Donut “bites” are popular for large events & dessert bars and only available by custom order. Q: Do you offer dessert bar packages? A: We do not at this time. Most desserts are priced per item which provides you a large variety of options if you would like. A: We can deliver depending on availability, size of the order, and venue location. A: We do not provide set-up or assembly services. You would need to provide all of your own platters/tiered displays and usually a coordinator/friend can help with set-up. Q: Can you help with decisions on quantities based on my guest count? A: Absolutely! We would LOVE to assist you with a quote. Feel free to send any inquiries to our e-mail at info@vgbakery.com. Please provide your wedding date, venue location, and approximate guest count.